....but you can save big on! If you haven't thought about it then you should really consider giving it some thought.... What are we talking about? Well here's a hint, we all use one everyday and more than once: a TOILET! When it comes down to it most people, even myself, don't think much about saving water and money by flushing your toilet and so on and so on. Well let us inform you and you make your decision from there. First lets do the comparison: You can save 77% of your water if your using a model made before 1980 (which are most common in home that haven't been built in the last 10-15 years), 68% of your water, or 54% of your water. 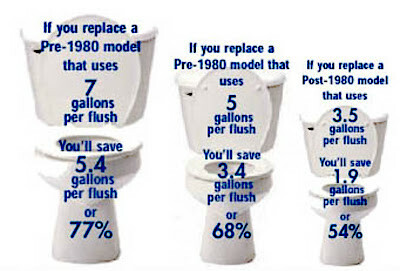 Every flush uses gallons upon gallons of water that you do not even think about. You're suppose to flush your toilet, we agree, but it gets costly in water usage and waste. Yet, these are great numbers but for people, (as myself who don't know much about toilets) I want to know the numbers on my money! How will I actually save money? 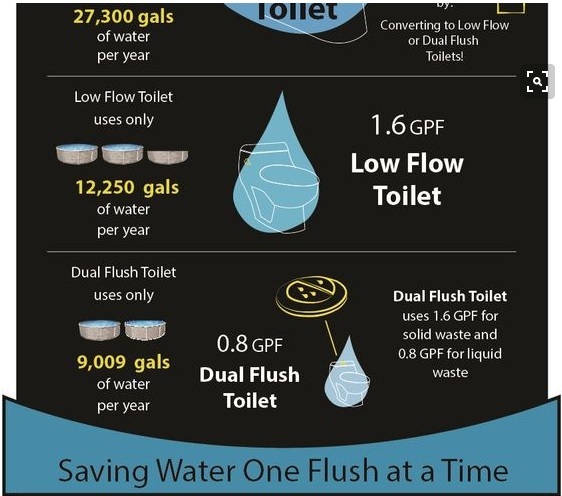 Looking over the Infographic to the right really gives me an understanding of how much water I use flushing, the benefits and the money I can save. It makes more sense reading I'm wasting an entire pool full of water or 20 gallons a day <that could serve an entire village> To the far right saving $50-60 a year is quite worth it! Imagine where that money could go... More coffee maybe? 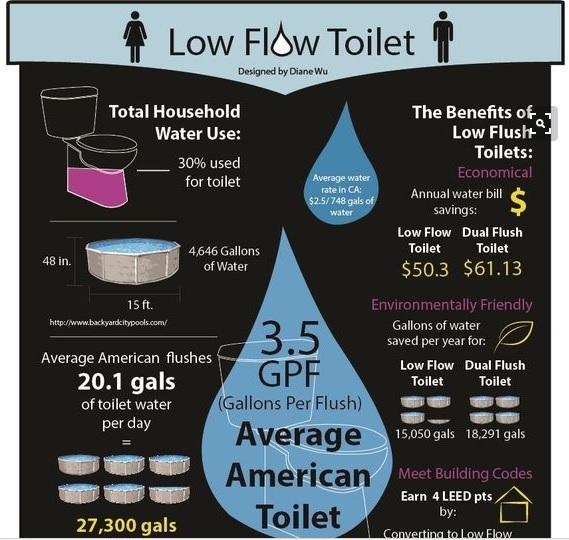 A low flow toilet can be pricey up front but think about how it will pay for itself the first couple years to come. Most people aren't buying a toilet everyday; and we get that; but when you do decide to save money or turn your home more water efficient, think about the things you use every day. The water faucet to brush your teeth or wash you hands aka aerators or when you flush your toilet three times yourself alone in one day... Consider the child who's amazed with flushing when you're potty training? The manly man who does the courteous flush? Imagine how many bottoms sits on your toilet and how much water you're wasting!! Pools and Pools upon Pools full of water!! Have questions? We can guide you! "You can save 77% of your water if your using a model made before 1980 (which are most common in home that haven't been built in the last 10-15 years), 68% of your water, or 54% of your water"